Jacaranda mimosifolia-Also called Jacaranda, Brazilian rose wood, blue jacaranda, blue trumpet tree. The jacaranda tree is a tropical beauty with its clusters of fragrant, purple, trumpet-shaped blooms. It makes an excellent shade or street tree. It grows to a height of anywhere from 5-50' tall and 15-60' wide. he leaves are pinnately compound, fine textured, and less than 2" each. Jacaranda can be either semi-evergreen or deciduous. Because of the dropping of flowers and seed pods it is suggested to not grow this variety close to swimming pools. 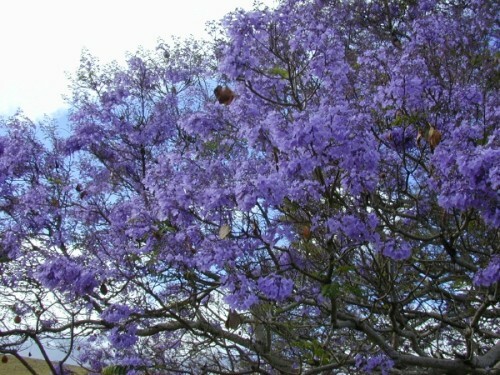 Jacaranda is renowned for its clusters of purple, fragrant, trumpet shaped blossoms. Most of the blooming is in late spring/summer, but in the warmer areas it can flower at any time. The fruit is a dry, brown, round pod that is 1-3" wide. The branches arch, making this a good choice to produce a canopy for shade. Plant in well drained soil. This tree is very drought tolerant and can grow in zones 9-11.